Recently, I attended a World Affairs Council event in San Francisco titled Is Africa the Next China?. James Manyika, Director of McKinsey & Company and also Director, McKinsey Global Institute, McKinsey’s economic research arm presented the findings of their study on recent economic trends of the continent of Africa. 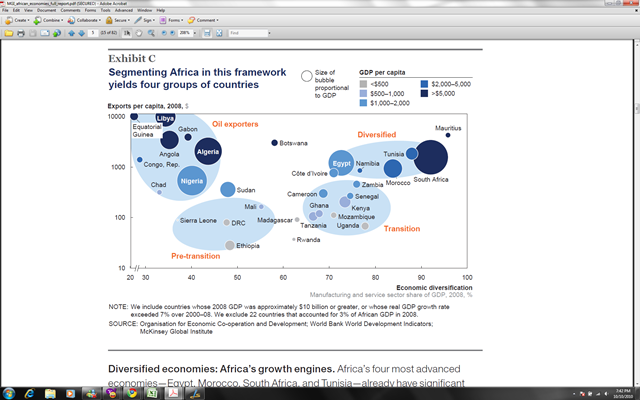 McKinsey released the report titled Lions on the move: The progress and potential of African economies in June 2010. (pdf documents of the entire report and executive summary can be downloaded here). Mayika presented some intriguing statistics on the continent’s growth over the last couple of decades as well as recent years. The premise being that as you peel back some of the growth statistics, you’d see similarities to China’s growth statistics before China’s economy and economic stature in the world started to take off. Now, during this one hour presentation, they didn’t really talk about China’s statistics, so I can’t really comment on how compelling that argument is, but I did find many of the following statistics about Africa to be intriguing, surprising, and a basis for real optimism. In 2008, Africa’s collective GDP was $1.6 trillion, approximately equal to Russia or Brazil’s GDP. In 2008, combined $860 million consumer spending, higher than India. 316 million new mobile phone subscribers since 2000; more than the US during same period. 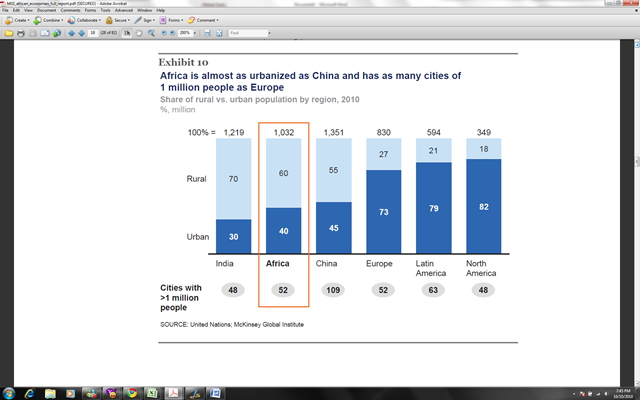 40% of Africa would be considered to be urbanized cities; similar to China’s level and a key metric related to economic growth. The rate of return on the last 2 decades of foreign investment in Africa has been more than most other regions in the world. By 2020, GDP expected to grow to $2.6 trillion. $1.4 trillion consumer spending by 2020. Of course, when one thinks of Africa, one typically thinks first of poverty, famine, civil wars, and unstable governments. Those conditions are certainly true, but in spite of this, Africa’s shown this type of potential. Mayika didn’t focus on those conditions, but rather than the economic trends. 1. Industry sources of the growth– after all if it’s all from oil generating countries, those countries are often the most politically unstable regions. 2. Country contributions of the growth– similarly, if the growth is only from a few countries such as South Africa, these statistics aren’t as meaningful. To address this question, Mayika showed this graph that demonstrates by industy by country breakdown of contribution to Africa’s GDP. Countries like Algeria, Nigeria, Angola, and Libya are certainly oil export economies, but economies like South Africa, Morocco, and Egypt are already large diversified economies. Likewise, smaller but growing economies considered transition economies like Kenya, Tanzania, and Zambia are in the process of moving from an oil focused economy to diversified industries. 3. Urbanization comparison to other regions– a few times, Mayika mentioned the urbanization level of Africa climbing to China levels—I wonder how it currently compares to the rest of the world. Compared to India’s 30%, Africa is at 40% and slightly below China 45% in 2010. Compared to Europe, Latin America, and North America, significantly below the 70% levels of those regions (for another day, would love to understand Latin America’s high urbanization ratio and its stature in the world economy). Overall, an eye opening discussion, I wasn’t aware of the momentum in the macro economic statistics being felt in Africa. I look forward to tracking this continued momentum in the future. The so-called “rate of return” is higher because it’s easy to buy off politicians to grant industries localized monopolies, then follow with price gouging. 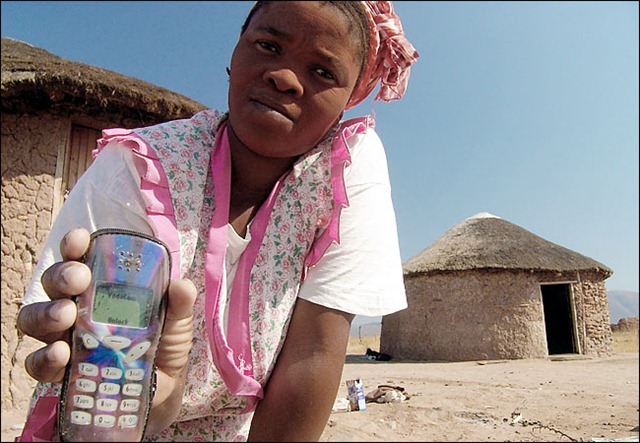 Example: Telecoms in South Africa. This makes the “rate of return” look attractive in the short term, but in fact is precisely counter-indicative for long-term investment potential.